Attention, Graduates! Bristol Bay lodges are still looking for qualified, responsible and friendly guides for the 2015 Season. We are excited to announce the dates & location for the 2015 Academy. Help us train the next generation of Bristol Bay guides! Our students learn professional development, fly fishing, river ecology, conservation, leadership & guiding skills at NO cost to the student. Please consider donating or spread the work about this campaign to make the Academy possible again in 2015. Thank you! Congratulations Bristol Bay River Academy Class of 2014! These students wowed all the instructors with their dedication and positive attitudes. We can't wait to see the great things they'll all do with their new skills! Here are just two highlights from Client Day, though really we could go on for pages and pages of all the successes from today! On day four, students put their heads down and did some serious preparation. Client day is looming and they have lots of preparation to do to ensure they’re ready to guide a stranger for a day fishing on the Newhalen. It was a little bit difficult to convince the kids to agree to a 7:00am breakfast... until we told them there was a fly-out planned for the day. Today was a big day at the guide academy. I’ll take you through step by step, because it has all been too fun to leave anything out. Our 2014 class has arrived, having flown in from around the region yesterday afternoon. They’ve completed orientation and covered some fly-fishing basics (gear handling, lingo, basic techniques), and are now hard at work learning to tie flies that they’ll use on the river tomorrow. 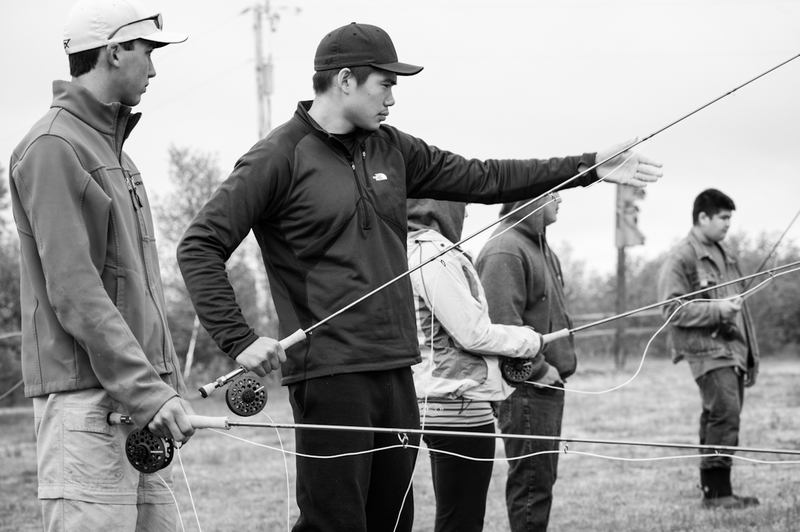 In its 6th year, the Bristol Bay River & Guide Academy is the only local training opportunity available for Bristol Bay young people interested in pursuing jobs in the recreation and tourism industry. The week-long river-side course will teach you the basics of fly-fishing, river etiquette, conservation and fisheries management with local biologists. You’ll also learn what it takes to be a guide and at the end of the Academy successful applicants are well on their way to securing jobs in Bristol Bay’s lucrative sport fishing industry. Through field trips and special guests you’ll learn techniques on sharing stories about life in Bristol Bay with people from all over the world. We hope you can join us this August! How to Apply: Fill out this application (Flyer_BBRA.2014) and return it to nwilliams @ tu [dot] org or by mail to 3105 Lakeshore Drive #102B Anchorage, AK 99517 by July 1st. This program is open to Bristol Bay residents or BBNC shareholders between the ages of 15-24.